Where are RF levels associated with smart meters in all their configurations (one meter, multiple smart meters, one collector meter, one collector plus multiple smart meters) above those recommended in the BioInitiative Report (2007)? Tables 32 and 33 depict the distance from the center of radiation for the smart meter(s) and collector meter scenarios in feet. The distances (in feet) at which RF levels exceed the BioInitiative Report recommended limit of 0.1 uW/cm2 is as small as 3.4’ (one smart meter at 60% reflection and 1% duty cycle). At 60% reflection and 100% duty cycle, the distance to the BioInitiative recommended limit increases to 34 feet for one smart meter. When multiples of smart meters are considered, the shortest distance to where the BioInitiative Report recommended limit is exceeded is 9.7 feet (for 60% reflection @ 1% duty cycle). It increases to 97’ @100% duty cycle for multiple smart meters. For a single collector meter, the shortest distance to a BioInitiative Report exceedence is 5.9 feet (60% reflection @ 1% duty cycle). At 60% reflection and 100% duty cycle, it increases to 59 feet. For a collector and multiple smart meters, the shortest distance is 10.9 feet at 60% reflection @ 1% duty cycle, and increases to 108 feet at 100% duty cycle. 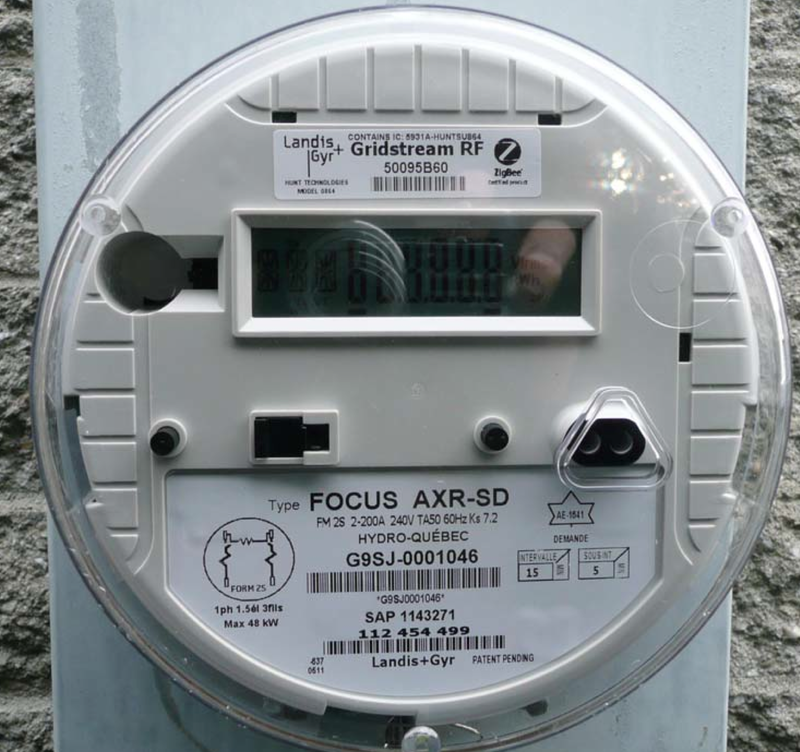 In other developments, Marin County on Tuesday became the 4th local government, and 2nd county in California to pass an ordinance specifically outlawing installation of ‘smart’ meters- in large part due to health and safety issues. This unanimous decision follows two successive Board of Supervisors meetings that were packed with outraged residents demanding that the County government pass legislation to protect human health. It also follows a blockade of ‘smart’ meter trucks in West Marin last week that resulted in the arrests of two mothers who blocked installation to protect the health of their children and community. People across California have complained about ‘Smart’ meters since the beginning, including widespread reports of inflated bills, privacy and hacking of personal information, electrical interference with cordless phones, baby monitors, home security systems and critical care equipment, and tripping of ground fault interrupters and arc fault interrupters on electrical wiring that is needed to protect wiring from electrical surges. In addition, there have been more than 2000 health complaints submitted to the CA Public Utilities Commission (CPUC). ‘Smart’ Meters use microwave radiation (similar to a cell phone) to transmit customer data back to the utility, and are being installed just as the public learns of evidence that brain tumors and other health damage can be traced to similar wireless devices. The CPUC, who sanctioned PG&E’s $2.2 billion program to install 10 million new meters throughout California at the expense of ratepayers, has not allowed individuals to opt out even in cases of severe health impacts. also demanded public hearings be held to study potential health risks resulting from exposure to radiation from the meters. Watsonville, Sausalito, San Anselmo, Belvedere, Monte Sereno, Novato, Morro Bay, San Clemente, Richmond, Ross, Bolinas, and Camp Meeker. January 17, 2011. The California Council on Science and Technology (CCST) recently released their report on Smart meters “Health Impacts of Radio Frequency from Smart Meters”. Click here to download this document. CCST invited me to submit a written report as part of a Technical Response Team in October 2010. In December I was informed that neither my report nor any of the others would not be appended to the final report nor would they be made available to anyone. My report does not support the final conclusions of the CCST report and I provide it here for anyone interested. For a pdf copy click here. On January 11, 2011, CCST released their report “Health Impacts of Radio Frequency from Smart Meters” on their website: Click here to download this document.http://www.ccst.us/news/2011/20110111smart.php. CCST is receiving public comments until January 31, 2011.
bands at frequencies from 902 MHz to 928 MHz and from 2,400 MHz to 2,483 MHz. devices and can be mounted onpoles or as part of a meter). This analysis will focus on the OpenWay CENTRON® smart meter. Smart meters emit 2 types of radiation both of which are dangerous and to which many people are sensitive. As described in this article, measurements taken after installation of a smeter, even with the transmitter turned off, show high EMF on the home wiring. What would be extremely useful and telling would be to have the measurements taken in a home with an analog, and the later if/when the homeowner is forced to accept a smeter with or without the transmitter activated. Taking measurements in this manner would be proof of the increases due to the smeter. 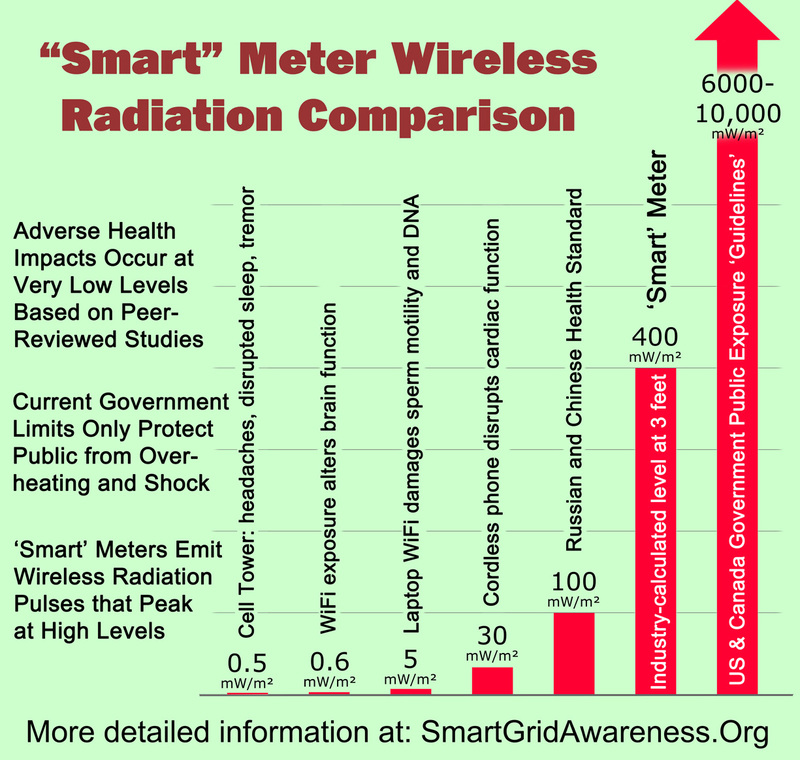 “The utility industry’s argument that smart (AMR, ERT) meters are safe must be rejected, because it relies on FCC testing for radiofrequency (RF) interference, which is not a safety testing protocol, and flawed FCC radiation exposure guidelines. The FCC testing for smart meters is done in an isolated laboratory, divorced from the context in which these meters are intended to be used, connected to the wiring in a home or business. I have enough problems without having some idiots trying to save money at our expence. Not in my house . Yet another way to compromise our health and feed the corporate greed of our nation! Over a year ago Rockland Electric Co. sneaked one onto our house, replacing our old reliable analog unit (so they could apparently save money by doing away with meter-readers). A few months later my elderly mother began acting quirky and was diagnosed with Alzheimer’s or at least a form of dementia, and I found myself feeling dizzy at times in the kitchen. This meter is mounted directly outside our kitchen window and my mother sits a foot away from it! 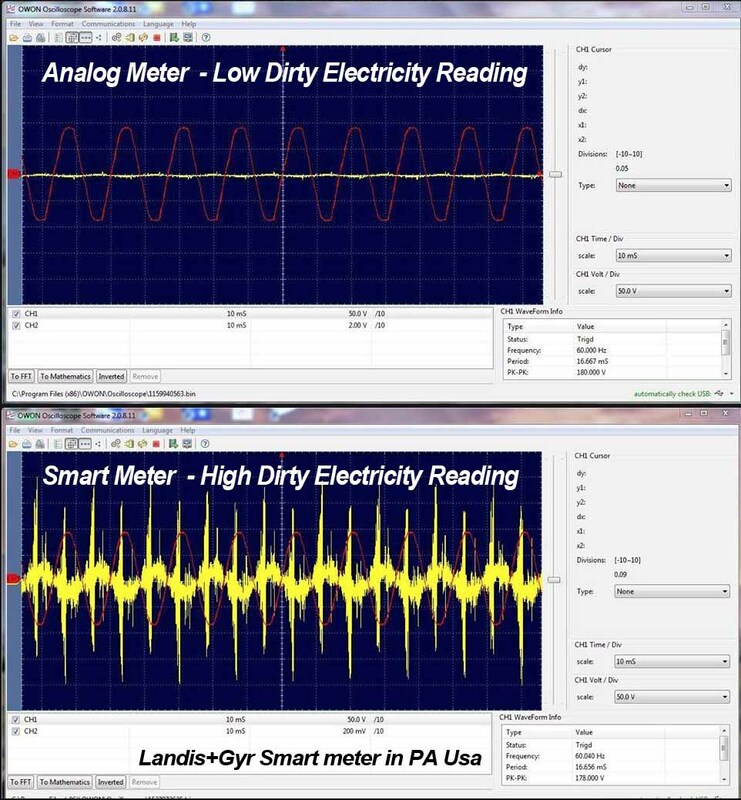 I learned what I could about RF and smart meters. The company consistently lied to me saying they send a meter reader to my home every month, nothing to worry about (and implications that I was a nut)–I hadn’t seen a meter-reader in over a year! My mother spent the last year in and out of the hospital with various conditions including syncope and seizures, degenerating cognitive conditions, wildly varying heart rate and blood pressure, Etc. The meter is still there. People think I am a crazy loon, too. We have no wireless tech in this house. Just an emergency cell phone in the car now. Everything is wired short of the infrared TV remotes. I’m disgusted, depressed, and helpless. to be reported through RF transmissions. Messages can be retrieved using either a mobile receiver or handheld off-site reading device.